Christmas is indeed the most-celebrate and most awaited holiday event in a year. Many people around the world, regardless of class and social status, celebrate this season with so much fervor and joy. The celebration of this festival is also one of the grandest and luxurious. Everyone seems to be in a festive mood during this time. Christmas is also a time for showing love and caring to one another, especially to family and close friends. Hence, exchanging Christmas gifts has been part of the tradition which has been passed from generation to generation. 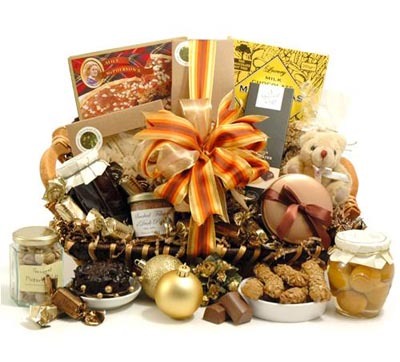 Christmas hampers is one of the great gift ideas for holiday occasion. Everyone would surely love to receive a basket filled with stuff she/he loves. This is significantly beneficial for those who don’t know exactly what their recipient want. That is aside from the fact that you don’t have to worry about giving a cheap gift. Basically with hampers, you can buy small items and pack them into a sturdy pack or basket. Make it fancy and looks like expensive by wrapping it up with nice cellophane, adorned with ribbons. There are different types of gift hampers. They vary depends on its content and theme. What you buy will also depend on what your recipient want for Christmas. For an instance, a corporate hamper is perfect to give to your superior, client and co-workers. On the other hand, grocery basket is perfect to give to your neighbors and acquaintance. Here are some of the common Christmas gift basket ideas. 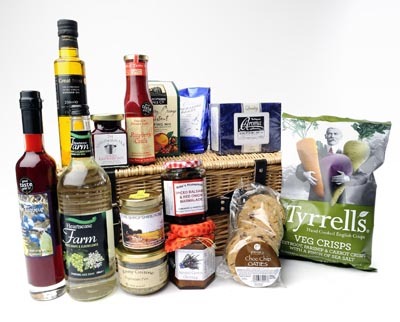 Who can refuse a hamper featuring different food items that can delight both a cook and a foodie? Specialty food ingredients and items like cheese, olive oil, ham, biscuits, special seasonings, tea varieties and some fruits can turn one’s Christmas into feast. This is also best accompanied with high quality wines and beverages. Arrange them beautifully and elegantly in a sturdy hamper and wrap it up with clear or colored cellophane. 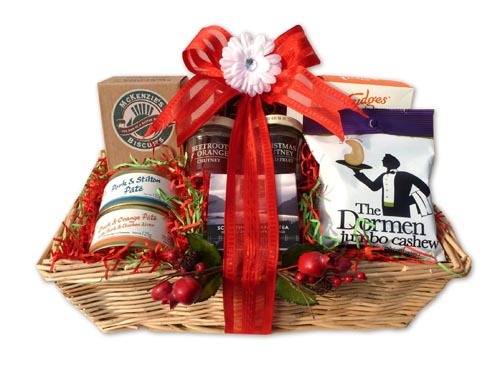 Gourmet gift basket is also perfect to those who want to give out a luxury holiday present. 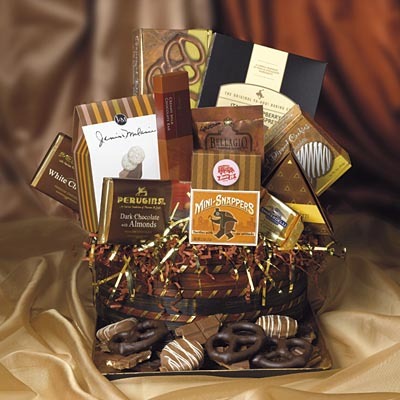 This is one of the most popular (and my favorite) hamper. This can be an ideal present for your co-workers, grandparents, uncles and aunties. A collection of high quality cheese brand and gourmet, arranged together with some fine wine will surely send some delight to your recipient. A healthy choice of food items for vegetarians may include calorie-free biscuits, organic fruits and vegetables, rice, spread for breads, vegetarian milk and cheese. Others may include no-meat ingredients, drinks, organic coffee and tea, pasta, sauces, vinegar and oils. Chocolate? Oh my, where’s chocolates? Whoever give me a chocolate basket filled with chocolates and sweet goodies will surely win my heart! This is a love tip that most guys used! Giving their fiancée and girlfriend a delightful collection of chocolate items makes their partner love the more. So guys, start picking different kinds and brands of chocolates (dark, whites, with nuts, with raisins, etc) and arranged it in hamper. Add champagne or red wine for a romantic touch. Who says food? I love food! And I would like to have some this holiday, perfect as I spend my vacation from work! This will surely give delight to me, so it will bring smile to others as well. Include some meats, fancy crackers, olive oils, pasta sauces, seasonings, dressings and fine cheese to your foodie hamper. Condiments of high quality brand like vinegar, pastes and fillings can add delight to your present. For beauty fanatics, a collection of beauty products put together in a box or hamper can be a great present this holiday. To give you some idea, you can include items like cotton wool, lipstick, face mask, dry shampoo, hair conditioner, moisturizers, exfoliating gloves, bubble bath, lip balm, towel and bath soap. Women, at least those I know, love luxury and pampering. Hence, if you would like to make her happy and make her Christmas merrier, give her something that will make her feel pampered. 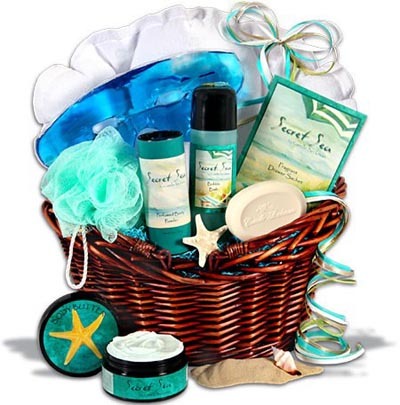 Relaxation items like bubble bath, Epson salt, spa gift set, body lotion, moisturizer, hair products, essential oils, and other arranged in a gift basket will surely give delight. Find out your man’s likes and interest, even his hobbies. 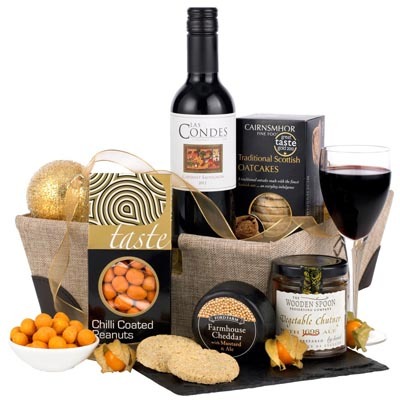 From there, you should be able to come up with the perfect hamper ideas. But to give you a safe option, you may want to go for accessory hamper featuring handkerchief, neck tie, belt, wallet, cufflinks, watch (if you can afford), underwear, socks and others. There are ready-made and wrapped gift baskets available that you can buy from stores. But depending on the theme you want to get for your beloved mother, you should probably get the best hamper for her. Just remember, get her something she needs and wants. For example, if your mom loves gardening, how about getting her a basket filled with gardening stuff. Same goes to those moms who love baking, knitting, crocheting, etc. Getting something that will make her relaxed even just a few days is also suggested. How about a spa gift hamper? Include at least 1 gift certificate where she can spend at least an hour or two in her favorite spa center. Just like what you get for your mom, you can also grab something that your dad needs and wants. For coffee addict dads, a gift hamper filled with gourmet coffee and coffee mugs would be a great choice. For wine lovers, you may grab his favorite wine brand and set it up in a hamper together with wine opener, flutes or wine glass and some side items like cheese. For techy dad, how about getting him some sets of phone accessories, new ipad cover, touchscreen protector, and gift cards for his favorite apps. For car enthusiast, you can find miniature sets of cars of his favorite. You may also include some car accessories too.